Should you invest in Hudco tax free bonds? Home » Investment » Should you invest in Hudco tax free bonds? After REC, PFC & IIFCL tax free bond Housing and Urban Development Corp (Hudco) is in market with tax free bonds. This issue will remain open from 9 January to 22 January. The issue seeks to raise Rs 750 crore with an option to retain up to Rs 5,000 crore. 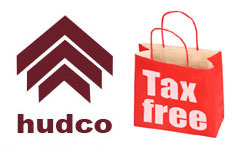 Compared with IIFCL bonds, for which the subscription is open until 11 January, Hudco bonds offer better coupon rate. The coupon rates for IIFCL bonds is in the range of 7.69 percent, 7.89 percent and 7.90 percent. However, the rating for IIFCL bonds is one mark better than these bonds, which is CARE AAA, which is stable to bonds. Point to consider before doing investment in Hudco bond. Hudco bonds offers higher coupon rate compare to other bonds. The annual interest with Hudco bonds is better than the post-tax returns of fixed deposits, which is 5.8-6.2 percent. Hudco bonds are available with tenors of 10 and 15 years long-term lock in period. Hudco Bonds can be traded on NSE but you will have to pay capital gain tax. Government may discontinue tax-free bonds in the coming Budget, so the prices of such bonds may go up. If your risk appetite is low and you need safe secure return you may consider investing in this bond. But, before investing, do look into your long-term fixed income allocation. Once you have exhausted your PPF and EPF, you could look into investing in these bonds. It is quite expected that Reserve Bank of India cut interest rates this month-end. So those who are looking for fix return this could be a last opportunity to lock in at a higher rate for a long period.